Have you noticed little black gnats flying around your houseplants or outdoor potted plants? These are probably fungus gnats. These can be a serious problem in commercial greenhouses holding thousands of plants but are easily controlled by homeowners who take appropriate steps for eliminating these pests. As weak fliers, fungus gnats live in and around damp decaying material. Plants with fungus gnats are usually being overwatered. This is the primary cause for an increase in the gnat population, as they thrive in wet, organically-rich soil. Gnat grubs nibble on the tender roots of houseplants, but they do not generally do enough damage to severely harm the plant – they are more of a nuisance as they mature and fly around the plant. These gnats do not bite, but they can be annoying. When an infestation is bad, they can quickly spread from plant to plant, making them even more challenging to control. Letting a plant dry out between watering will decrease the decay and fungus in the soil, making the pot less hospitable for fungus gnats. Always make sure pots have adequate drainage and that water is not left standing in saucers. Adding a porous top-dressing, such as sand or gravel, to the pot can also help water drain away from the surface so the gnats cannot burrow down to the organic richness they crave. For home use, insecticidal sprays with Pyrethrins are available and can be used against fungus gnats. If treating a houseplant, be sure to take plants outside and follow label instructions carefully, keeping the chemical away from children and pets at all times. Bacillus thuringiensis (BT), a biological control, will also provide relatively fast control killing the larvae in the soil. 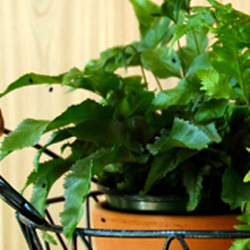 For houseplants, the easiest and fastest remedy is often the best. Repot the infested plant using new potting soil into a pot with drainage. Carefully rinse the plant’s roots while repotting to remove as much soil as possible, and be sure the new pot’s hole is not clogged. Prune away any dead roots, leaves and stems. The gnats will be gone immediately. To keep fungus gnats from returning, carefully check a plant’s moisture before watering to prevent moisture problems that can bring fungus gnats back in a flash. Water monitors can be used, or simply check that the top 2-3 inches of soil is dry before watering. Using watering bulbs or other waterers that are inserted deeply into the soil can also keep fungus gnats at bay by providing water directly to the plant’s roots, without saturating the entire pot. 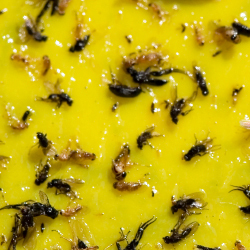 Fungus gnats certainly aren’t fun when they infest your plants, but fortunately there are many ways to keep these bugs under control or eliminate them entirely. Using several techniques at once will be most effective, and the gnats will be gone just as fast as they first appeared.